Promotions should always be directed to your clientele. There are many simple ways of doing this and I shall try to touch on several. An advertisement in your local newspaper, a sign posted on the store window, a radio, e-mail, TV announcement, or simply a USPS mailer are all ways deliver your message. Sometimes you may want to develop a niche market, and an expensive general advertisement can be a shotgun blast that could miss the target. Perhaps it is a specialty for the elderly or new parents, athletes, women, diabetics, or healthcare professionals. All take a slightly different approach, and when you partner with the specific vendor, you will achieve success. Develop a format and try to be consistent with your communication. Once people recognize your pattern, half the battle has been accomplished. This becomes name recognition, and that, in a very competitive market, is very important. “Jack’s Home Health Care” needs its own logo and this becomes their trademark. Once people see it on every piece of literature, in the showroom, on the signage or in the mail, it gains recognition. *Your picture or one of the front of the store is always good. Simply stated this will become part of your logo! You should be very proud of these affiliations. They provide stature. At Medtrade in Orlando you will discover sufficient new ideas to build sales and profits. Use promo code MTShelly when you register for Medtrade to get a free Expo pass. Let the politicians fight this program out, but make your plans now, not tomorrow! Support AAHomecare and your state association and allow them to guide you. No one can really predict how a DME/HME provider will be affected when all these regulations are put in place. As many new citizens will qualify for coverage, they will provide a boost for your company. Will you have to provide coverage for your employees? That might be a negative for your company. However, rather than worry about what may happen, think about who can guide you. There are still several months before these requirements become the law. If you have to spend money, be prepared. It is better to spend now and not lose tomorrow. Trying to have any influence by yourself to change any part of this legislation is impossible. But, Congress will hear the voice of your state association in conjunction with that of AAHomecare. My task, as I see it, is to get every DME/HME dealer to partner with the state and national associations. It will take many dollars, many man-hours and much communication to get the changes we seek into these legislations. ObamaCare is not the end of the world for your company. There have been many attacks on our industry and I have watched how the state associations and AAHomecare have worked and accomplished so much for their members. I ask all non-members not to become a FREDDY THE FREE-LOADER but to BECOME ACTIVE MEMBERS NOW. That is how you will save your company from being forced out of business. The ability to correctly communicate with your customers and your referral sources is vital. This is particularly true today as DME/HME dealers are fighting tooth and nail to replace the competitive bidding legislation and develop niche markets and new OTC cash sales. Developing an effective communication program does not mean running out and hiring an advertising company and spending big dollars. NO. It means working within a budget and using many of your preferred vendors to assist in this effort. Before you engage in any advertising program, set specific objectives and goals. What do you want to accomplish? An objective could be to develop name recognition for your company. You can send an explanation of the services provided by your company, or your outreach can be product oriented. I feel that you should always feature in your advertising a new service or a new product you are introducing. It does not have to be an expensive program. One dealer ran an ad about arranging a consulting section on his showroom floor. He called it the “Family Consultation Area”. He told me this has become a focal point of his showroom. People started coming to him from throughout the community, not only his customers, to discuss problems with him. This has led to many new sales and many new customers. At Medtrade, discuss with your vendors co-operative advertising. If you haven't registered for Medtrade yet, go ahead and use this promotional code to get a free expo pass: MTShelly - Register by Clicking Here. I had a chat with one of the exhibitors at Medtrade in Las Vegas a few months ago. I can recall just about the entire conversation we had. The person I spoke with was not a principal of the company but was a truly excellent salesperson! I asked where the management people were, since I always looked forward to visiting with them at the Medtrade Exhibitions. I noticed that they only took one space while in the past their company would reserve several. Who else is working with you? The answer was that, “Some of our manufacturer reps have been helping me.” When I had the chance to meet one of these reps, I found that the attitude of this manufacturers’ team was negative. This was embarrassing for me and I could hardly believe what I heard. By the same token, some 15 steps further down the aisle was a very busy booth. This was a considerably smaller company, but they filled four spaces and yes, they were busy! They had a team; the principals and their salespeople and reps were working non-stop. They were writing orders, making deals, arranging for “dog and pony” days when the show was over to meet and speak with their dealer’s staff. Attitude! Since I have had the privilege of attending all the Medtrade Exhibitions, I can make the following comment. “Some of the previous major exhibitors felt reducing the number of salespeople, booking less spaces, even reducing advertising was correct because the country was in a recession.” - This is a Negative attitude! I had the pleasure of touring the exhibition with Russ Willcott, Editor at “HomeCare Magazine” and together we reported about the displays. Those companies who displayed with a positive attitude saw a great ROI from their investments. We managed to beat the depression! At the Fall Medtrade, I anticipate seeing the big displayers working with the dealers and watching the other exhibitors busy writing orders and developing new customers. They too, are becoming bigger and more aggressive. ATTITUDE! Good positive attitude will make the difference. I wrote this memo more than twenty years ago. Nothing has changed. An old friend sent it back to me recently, and it brought tears to my eyes. He said he saved it because it had become the center of everything he accomplished. THANK YOU!! “Over the years, I have heard dealers make “pie in the sky” promises about what their company can do, how many dollars one can save by working with them, and other grandiose claims. There are certain basic things that dealers must always do, or not do, as the case may be and that is “to promise.” You must never promise to do anything that you cannot do. Far too often, dealers overestimate their abilities and make rash commitments. Once you fall down, fail to perform as promised; you may never get a second chance. When you do obtain an assignment, whether it is via managed care, Medicaid, Medicare, or other, your performance will be critical in helping you obtain more referrals. There are simple ways to help you identify and then reach goals. Whatever the order is for, you must prepare your staff to give the payer the end result they want. Take a very simple order. You are delivering a bedside commode. Does your driver knock on the door, hand the commode to whomever answers, obtain a signature and return to base? Or does your driver unwrap the unit, help the patient or family caregiver place it by the bed, review how to clean the commode and show how to move the patient in and out? Usually it is the second scenario, but does the source of the order (physician, case manager, HMO) know that this has been done? That is your task. A memo should be sent indicating who delivered the unit and specifically what they did while making the installation. Over performing, that’s what wins. Haven't registered for Medtrade Fall yet? Use the promo code MTShelly to get your Free Expo Pass. "There is a world of difference between fighting to win a game and struggling to save one’s livelihood. I will never, ever surrender; I will always fight, with every bit of strength I have to save my business! I will seek and find every ally and friend I have and we will ultimately succeed." In the Medtrade Monday (7/15) Newsletter, John Shirvinsky quoted Vince Lombardi: “Winners Never Quit and Quitters Never Win.” I am in complete agreement with John & Vince. I find it fascinating when I see what AAHomecare and the state DME associations are doing! If we want our businesses to stay solvent, then everyone must get together and become a team, “Winners never quit,” do they? I picked up the phone and called two local providers and asked them what their plans were. Both told me they already sent letters and spoke to their Congressman’s HLA. One said he will try to find a flight to be there for the Fly-In on Thursday. My reason for writing these blog entries is to share my experiences in the DME/HME industry. I had a very interesting phone call the other day, and it opened my eyes to a rather serious problem. In the few years that this blog has been active, I’ve received many phone calls (321-255-3885) and e-mails shelly.prial@att.net about the Medtrade exhibitions. As the “Good Will Ambassador” for the show, I am the one to contact. I can relay that the greatest number of the reports I receive are positive about the show. This was particularly true about the Spring Medtrade in Las Vegas. It was a winner! I received really great comments about the speakers and many were very enthusiastic about what they brought home from Las Vegas. But after the Spring show, I did receive two negative comments about the Medtrade expositions! I made it a point to contact them on the phone. I was very careful in my response. I started our conversation by asking him which associations he supported; state, AAHomecare, buying group, etc.? “None, I cannot afford that luxury!” was his answer. After about a half hour, he admitted he last attended a Medtrade four years ago. As we discussed what took place in the economy and how other dealers not only survived, but also grew, he realized he was at fault. My conversations with the other dealer were much the same. It is very easy to complain! It is so easy to just pass the buck. BUT, it is much easier in the long run to “roll up your sleeves” and lend a hand to resolve your problems. MEDTRADE is the answer, and if you do not take advantage of the most important opportunity ever to improve and expand your company, there are others who will jump right in and you will lose everything. In the next few weeks I will tell you about the many new and exciting opportunities which you will discover in Orlando at Medtrade Fall! Many exciting things are happening which makes the future of DME/HME brighter than it has been for many years. In order for our industry to enjoy these changes, there are some upcoming events in which you must participate! In this fashion we will be able to stay on target. July 18: AAHomecare is asking you to send to CMS every report you know about concerning delays in providing supplies in Part 1, and also now as we enter Part 2. Was equipment not available? Did the patient have to wait, or did the dealer refuse to give service? It appears that CMS has made up their mind that part 1 went so "well". I have heard testimonials from providers throughout the country detailing how patients were mistreated. This will be an ALL-IN operation between AAHomecare, state DME associations, The MED Group, and VGM. I would like to see every DME/HME dealer on board in this battle. Today: Use the powerful weapon you own: your telephone. Our challenge here is a “life or death” situation. Our situation, if HR1717 does not get passed, is that we will be see many fine DME/HME companies forced to close. Please call your congressman, whose local phone number is in the telephone directory. Ask them to co-sponsor this bill. If only one or two dealers in the 500 plus districts in the US make that call, we will be successful. Do not sit by and wait for someone else to make this call. There is no one else! Your business, livelihood, family, employees and customers as well as their well-being is at stake. Right now: If your company is not currently a member of both AAHomecare and your State association, then join right now. Commit! That is your only way to make sure you will remain in business. October 8 – 10: This year in Orlando, the Medtrade exhibition will be conducted differently. Every vendor, every association, every speaker and every attendee will be planning for the future. Gloom and doom will be forgotten. DME/HME will now become a NEW INDUSTRY. Register for Medtrade using the promo code MTShelly, and get a Free Expo Pass. Respond to all these upcoming events and as Vince Lombardi so aptly said: “If winning isn’t everything, why do they keep score? Friend or foe, ally or competitor, partner or opponent – What is the role of a home health agency or that of a visiting nurse association? Are they an active player on the health care team? They certainly are! They are the key team players for us! The nurses, who are healers at a patient’s bedside, are the best associates for a DME/HME provider, and when we work in tandem with one another, the patient is the winner! In every community there are both VNA and HHA associations and it behooves you to become their friend. All the many years I was a provider, my first goal was to work closely with them. We became associates on behalf of our most treasured asset, the patient. I opened the telephone directory yellow pages and found the VNA and the HHAs in a 30-mile radius from my location. I called each, introduced myself and invited them to please stop by and say hello. I also asked if there would be any objection to my visiting them. Invariably the response was positive. Once we became friends, I prepared a series of demonstrations conducted by key manufacturer reps. These were always SRO. The nurses enjoyed seeing the many things that could be done, even with beds and wheel chairs. We scheduled these every-other Wednesday as one-hour sessions beginning at 4:00PM. There was a bonus we received because the nurses told me they bought personal supplies from mail order company catalogues. They were pleasantly surprised we could obtain any items they needed and appreciated the professional discount we gave them. I will not say any more because it was successful and every DME/HME dealer can do the same! Yes, VNAs and HHAs are your best friends. Are you comfortable where your business is sitting today? Is your company ringing up more sales than it has in the past year? What can you do now to create new and additional sales with larger profits? The fluctuations in the “stock market” should not affect your plans; be it expansion, new products, or adding another salesperson. Look where the market closed last month and that will tell you that the United States has rebounded and is rapidly returning to normal. Jobs are being found, homes are selling again, and suddenly the middle class is shopping with much more enthusiasm (i.e. : automobile, grocery, and luxury sales are exploding!). How do you plan to take advantage of these changes? One DME provider said he hired two new salespeople and after only a few weeks his sales are beginning to increase already. Another told me that after he reviewed our ideas about the importance of brightly lit signs and displays, he repainted the showroom and increased the number of lights. He identified the marketing segments on the showroom floor, and assured that every item on display had a price tag affixed. He never anticipated the ROI this created. All he could say was, “Wow!” People who came in just to see what he did were walking out having made OTC cash purchases. During the many years I was in business, I never reached a comfort level. We kept expanding and my staff and I found the hunt for our “comfort level” pushed us to work harder and more diligently. Our employees were well rewarded as the business grew, and so was I. We always took a few of our staff to Medtrade and there they found more cash sale OTC items that fit perfectly into our operation. You, too, should do the same! Bring your team, and together you will locate many opportunities and set new comfort levels. America is graying! We have heard this often in the last few years. Today we know that the majority of senior citizens have sufficient discretionary dollars available for “luxury” and comfort items. A good way to reach them is by running an ad on the obituary page of your local newspaper. It sounds grim, but every older person I know invariably turns to the obit page first when they get their copy of the news. Be specific in your advertisements; whether using mail, radio, TV or newspapers as a medium, it's important not to generalize. Offer a particular product - something seniors can readily identify. If you want to promote your line of incontinence products, offer a specific diaper. Feature nationally recognized brands; names your customers will recognize. The big companies spend mega-bucks for brand identification, and you might as well take advantage of that. Many preferred vendors will help you with good advertising slicks aimed at today's senior citizen. Something that means a great deal to an older person is recognition and respect. They usually do not want to be addressed by their first name, but rather as Mr. or Mrs. Jones. This is particularly true when being greeted by younger employees, most of whom may not be as old as their grandchildren. A complaint that I often hear is how they dislike shopping in dark, dingy stores. They look for very brightly lit establishments. Far too often, a senior citizen will suffer from poor or diminished eyesight. Well-lit, clear aisles will prevent them from bumping against anything. This is a must. Senior citizens do not like to ask for a price on displayed items. If the product you offer is not price marked, it might be dismissed and not purchased. I repeat: If the price of an item is not boldly recorded and easy to read, the product is much less likely to be purchased. “When in the course of human events it becomes necessary for one people to dissolve the political bands which have connected them with another and to assume among the powers of the earth, the separate and equal station to which the Laws of Nature and of Nature’s God entitle them, a decent respect to the opinions of mankind requires that they should declare the causes which impel them to the separation”. “We hold these truths to be self-evident, that all men are created equal, that they are endowed by their Creator with certain unalienable Rights, that among these are Life, Liberty and the pursuit of Happiness. --That to secure these rights, Governments are instituted among Men, deriving their just powers from the consent of the governed, --That whenever any Form of Government becomes destructive of these ends, it is the Right of the People to alter or to abolish it, and to institute new Government, laying its foundation on such principles and organizing its powers in such form, as to them shall seem most likely to effect their Safety and Happiness”. Wheelchairs are an important sale item for DME/HME dealers. How best can you display them? If you do not have a large showroom you must find a way to make them very visible. I have visited many dealers and observed several attractive displays. It is not size of the display. It is how you show the chairs! When visiting many dealers throughout the country, I am appalled too often at what I call “naked” wheelchairs. Make each chair a silent salesperson! Simply affix to each chair all the add-on sale and comfort items you can find. Use the ADA requirements as a guide. Every wheelchair on your showroom floor must work for you. If you are limited in space, preparing a stand for the chairs is an excellent idea. While visiting a DME dealer in a small town, I saw an interesting display. This entrepreneur built a 4-inch high stand on which he could only display four or five units. Each chair was different and loaded with every comfort item he could attach. Be sure that a different cushion is placed on each chair and there are several types of safety belts. They should be mounted. Cup holders, wallet holders, ashtrays, and items like anti-tip devices; oxygen cylinder holders, brake extensions and backpacks must be shown. They all help you make the sale and remove any hesitation when the purchaser recognizes how these will all be of tremendous value. A local dealer in Melbourne, where I live, has a wonderful display and every chair is loaded. He told me that in more than 90% of his sales, whether Medicaid, Medicare or other insurance, the patient usually bought at least one or two additional items. The number of discretionary dollars available is large, and most people are willing to pay more for extra comfort. Today’s senior citizens and family caregivers have many disposable dollars. So my advice is to put every wheelchair on display to work for you. Show and sell! I see that at Medtrade in Orlando, there will be many new and original add-on items which will be introduced. I am looking forward to being there and I know you feel the same. Mike Sperduti (Emerge Sales) and Kevin Gaffney (Medtrade) have developed HME Voice, powered by Medtrade Radio. 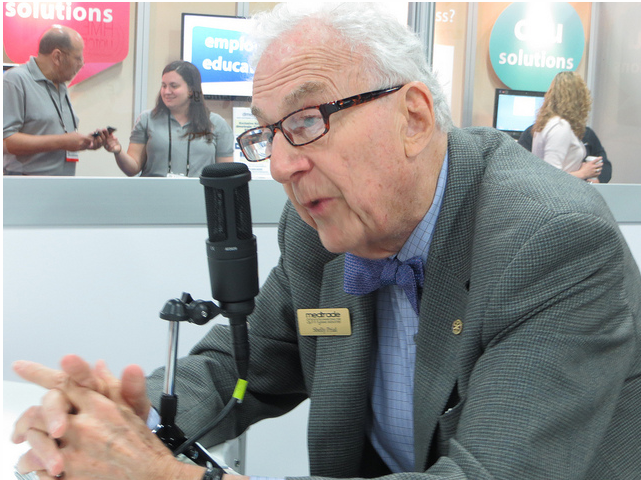 Yes, my words were broadcast and are available to all on Medtrade Radio! What a privilege! I anticipate much good communication as a consequence of this new program. I apologize that I no longer have a crystal clear voice. I sounded like the typical old man that I am (now in my 87th year). Realizing what is at stake, I was proud to have been asked to participate, especially when being included as a speaker with wonderful, well-recognized leaders such as Jeff Baird, JD, and Rick Worstell. I also enjoyed hearing the news from Liz Beaulieu from HME News and "What's Been Buzzing?" Social Media Tips from Medtrade's Christina Brown. Our industry has many ways to work together. When we all join together we will be in control of our future. There are MedtradeMonday, HomeCare Monday e-newsletter, and HME News wire coming every week. We receive bulletins from all the state DME associations, VGM, MED, and are fortunate to have AAHomecare as our leader in Washington. As recipients of information from all these, our industry should be able to accomplish much more. Why don’t we? There are 15,000 recognized DME/HME providers in the United States, but too few are members of their associations. Without their support, which means being dues paying members, these associations find that their hands are tied. I ask everyone to join me in my effort to get at least 90% of the dealers and providers to join forces. Then, and only then, good things will happen. We will be capable of getting all the required legislation through Congress and signed into law by the President. DME/HME will then be recognized as a profession, not just as storekeepers!